We guarantee ACS 200 Extra Strength to be the most effective medical-use silver you have ever prescribed..
using ACS 200 Extra Strength." ACS 200 Extra Strength has been proven extremely safe in independent acute oral toxicity studies. ACZ nano Extra Strength effectively eliminates body burden of toxic heavy metals, neurotoxins and free radicals. ACZ nano Extra Strength has been shown to increase urinary output of Mercury by up to 55,300% over baseline during only 12 hours of post-provocation urine collection. ACZ nano Extra Strength employs nano size and a significantly greater number of zeolite crystals per dose than other zeolite products, providing far greater surface area and superior results. ACZ nano Extra Strength selectively and irreversibly binds and expels toxic heavy metals, VOC's, radioactive toxins, free radicals and more without removing nutrient metals. 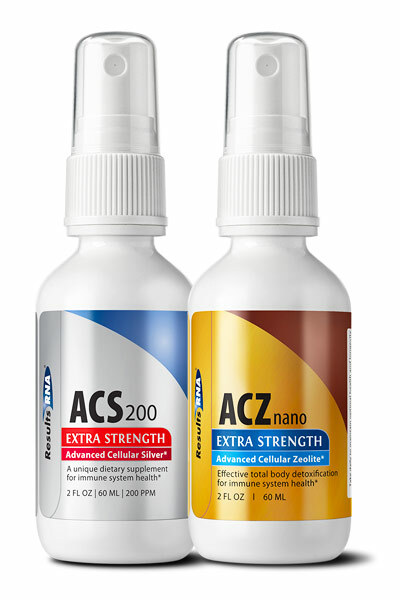 ACZ nano Extra Strength is the only zeolite-based detoxification product provided in a convenient intra-oral spray. The need for detoxification is based upon the principle that immunodeficiency, inflammatory and degenerative diseases from allergies to arthritis to Alzheimer's result from the toxic, accumulative effects of poisonous substances and pathogens within the body. Detoxify your patients with a proven detoxification protocol. Total Body Detox Extra Strength, comprised of Advanced Cellular Silver (ACS) 200 Extra Strength and Advanced Cellular Zeolite (ACZ) nano Extra Strength provides systemic, concomitant reduction of pathogen and toxin burden with exceptional patient outcomes. The leading silver-based supplement in multiple independent comparison studies, ACS 200 achieves 99.9999% (complete) kill against Candida albicans, Rhinovirus and MRSA (Methicillin resistant Staphylococcus aureus) in less than 3 minutes as proven via independently derived in vitro, benchmark kill-time studies. ACS 200 is the only antimicrobial proven to kill Borrelia Bergdorferi, the Lymes Disease associated pathogen. When choosing an immune system support formula, efficacy and safety are the only two factors that truly matter. Without harming the gut flora ACS 200 Extra Strength provides fast and significant relief. Advanced Cellular Zeolite (ACZ) nano Extra Strength: Binds and Expels Toxic Heavy Metals, VOC's, Radioactive Toxins, Free Radicals and More. A powerful oral chelating agent, ACZ nano Extra Strength selectively and irreversibly binds and removes toxic heavy metals, such as Mercury and Lead, chemical toxins, VOC's, radioactive toxins and free radicals of all types through the urinary tract, without removing vital nutrients. These results have been verified in multiple, independent urine challenge studies. 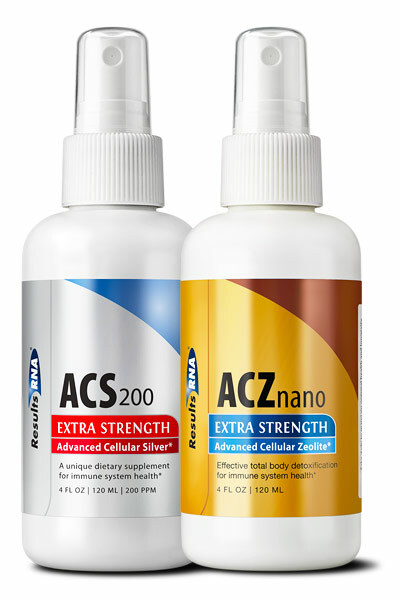 ACZ nano Extra Strength is the only detoxification product formulated to remove fluorine and chlorine, two of the strongest oxidizing agents known and found in most drinking water. Toxic Body Burden defines the accumulative and devastating interrelationships between pathogens and toxins. To reduce Toxic Body Burden (TBB), both pathogens and toxins must be eliminated concomitantly by an effectual, multifaceted approach providing both treatment and prevention. The combination of Advanced Cellular Silver (ACS) 200 Extra Strength and Advanced Cellular Zeolite (ACZ) nano Extra Strength effectively reduces TBB. The overwhelming success of this approach supports the premise that TBB leads to immunodeficiency; the body's own immune cells are incapacitated in areas of compartmentalized toxicity, whereas pathogenic microorganisms multiply and thrive in an undisturbed way. Pathogens such as Candida albicans have now been proven to utilize biofilms to bind toxic heavy metals such as mercury to protect themselves from immune cells within the body. 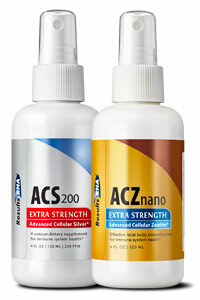 ACS 200 Extra Strength has been proven in vitro to penetrate biofilms and terminate infectious microbes on contact. 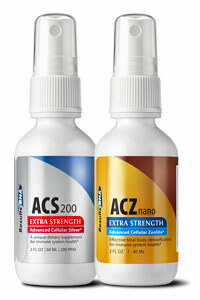 Toxins of all types are effectively harnessed and expelled from the body using ACZ nano Extra Strength. Total Body Detox Extra Strength will provide immense health benefits to your patients while providing increased and consistent revenue to your bottom line.